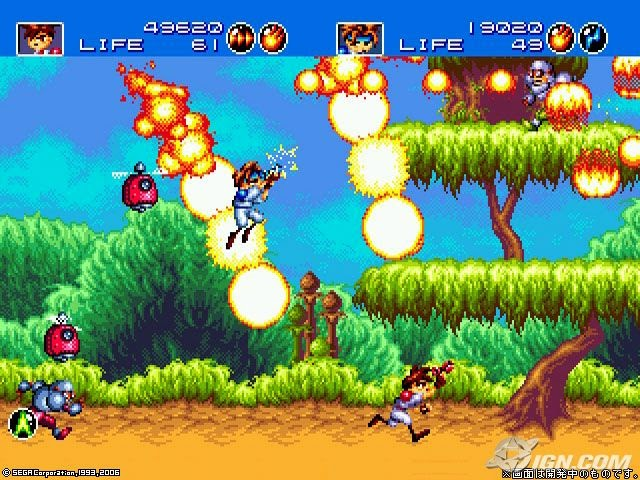 For those unfamiliar, Gunstar Heroes is a game full of explosions and stunning 16-Bit visual effects. For those who are familiar with it, you probably know the excitement I'm talking about when I recall playing it for the first time. I played this at a friend's house in 9th grade on the Wii's virtual console and my jaw dropped as I realized such an awesome game has been out of my life despite being around when I first discovered Sonic. On a sidenote, this game taught me what vitality means. There's a certain magic to games with simple controls and complex everything else. Just run, jump, point, and shoot. The guns and chaos handle everything else. 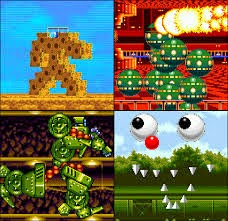 There were also some very interesting and technically impressive bosses that lit up my imagination. It's best to see them in motion because they don't move the way normal sprites do. I like the weapon combination system too. You pick two weapon types and their properties combine or double to make a superpowered weapon. I always went for the Seeker + Rapid Fire combo so that I could get a line of giant orange orbs that automatically homed in on nearby enemies to blow them to bits. This game really appeals to me for the same reasons I listed for liking Hack n' Slash brawlers. It's fun to tear through armies and the constant explosions on top of that made this game mesmerizing. Along the the gameplay came the graphics and the bright vibrant colors were what burned into my brain's permanent memory storage. Contrasting colors really are important to me because on a screen large or small, your guy and the things you interact with need to stand out from the scenery. Especially with pixels. It's why I draw white outlines around mine. As for the mobile version of this game, I'd like to find a way to clear visible buttons away so that there's more room for action. How do you make an interface for this? This is an action-packed pick-up-and-play game that let's you grab a friend and have a blast. I want to make a sidescroller that feels this exciting one day. A game where controls are fluid and players can enjoy the adventure and mayhem. Gunstar Heroes transported me back to a time where things were simple. I could just feel myself being a little kid again. Wake-up, eat crunch berries, pickup a simple controller and play Gunstar Heroes with my best friends. The next generation needs that experience.